Today, we depart from our normally-scheduled program to look at a seminal paper from 1972. Few papers in astronomy receive over 2,000 citations, though more will in the future as the number of astronomers grows. This paper, however, did. It was the first paper to propose that ram pressure stripping explained the observed absence of spiral galaxies near the centers of clusters such as the Coma cluster, and this is the result for which it is remembered today. However, when I read the paper, I was shocked to discover that the material on ram pressure stripping is essentially a throw-away comment, amounting to only one half of one of the paper’s 19 pages! The majority of the paper is actually about the growth of clusters of galaxies from perturbations to the background density in the very early (redshift ~1000, so ~300,000 years after the Big Bang) Universe. In this astrobites, I will discuss three things. First, I’ll explain the beautifully simple framework Gunn & Gott develop to predict the time-evolution of cluster mass. Second, I’ll go through the famous ram-pressure stripping mechanism. Third, I will point out that Gunn & Gott present a very early argument for the presence of what amounts to dark matter by using measured X-ray emission from cluster gas. The early Universe is roughly homogeneous (the same in every place), and isotropic (looks the same in every direction). This is because, as far as we know, it more or less began that way, and 300,000 years after the Big Bang, gravity had not had enough time to collapse matter into dense regions such as the galaxies we see today. Thus, one can take the background density to be the same everywhere. How will a spherical over-density—i.e., more matter per unit volume than the background amount—grow with time? Gunn and Gott assume that such spherical over-densities are what source clusters of galaxies today (clusters are the largest gravitationally bound objects, and are aggregations of many galaxies). The Universe is expanding (see my post on the Friedmann equations for why), so the background density will go down with time—you have the same amount of mass smeared out over more and more space. However, if you assume the spherical density perturbation is massive enough to be gravitationally bound (i.e., glued together by gravity), it will remain so into the future, and in fact begin to collapse as mass falls inward under gravity’s force. The spherical shell is like a bubble Universe with a space-time in it that, rather than having a flat geometry as our Universe does, will have a spherical geometry (and spherical symmetry, so the only important variable will be the distance r from the sphere’s center). This means that any given shell of mass at a radius r away from the center of the sphere will collapse completely in a finite amount of time that is determined completely by the value of r. Imagine an onion, each layer of which falls inwards towards the center—Gunn & Gott find that the outer layers take longer to fall in, as you might expect if you assume that layers will never cross each other. Each shell has a certain mass in it, and so taking the mass contained in that shell divided by the time it takes that shell to collapse gives the rate that mass is being added to the cluster forming from the spherical perturbation. This allows Gunn & Gott to find a relatively simple expression for how the mass of the proto-cluster grows with time. Ram pressure is a remarkably simple mechanism that any of us who have driven in a convertible, or even gone running, have experienced. It is just the idea that if you are moving through a medium, such as air, that has some density, you will hit more particles of that medium the faster you move, and hence experience a pressure. Of course, on Earth, we are being bombarded by air molecules from all sides at all times: this is in fact why we experience atmospheric pressure. The density of particles in the atmosphere decreases as you go farther above the Earth’s surface: that’s why airplane cabins must be pressurized—if they were not, the pressure at 35,000 feet would be too low for us to be comfortable. where P is the ram pressure, D is the density of the medium, and v is the object’s velocity through the medium. Gunn & Gott compare the ram pressure a galaxy moving within a cluster would experience due to the intracluster medium (just the gas in the cluster but outside of the galaxy) with the force available to hold the gas in a typical spiral galaxy. They find that, in the central regions of clusters, the pressure exceeds the force holding the gas in, so that spiral galaxies passing through these regions will be stripped of the gas they have between their stars. This agreed with observations that had been done even as early as the 1950s. 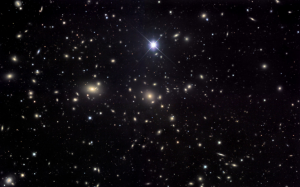 Previous work had ascribed this absence of spiral galaxies to collisions between galaxies, but the density of galaxies in clusters is low enough that they will not collide with each other often. where v is the speed at which an object at distance d will be observed to recede, and H_0 is a proportionality constant. Up until 1998, when dark energy was discovered by measuring the accelerated expansion of the Universe, the expansion rate was thought to be decreasing with time: i.e. H_0 was going down with time, and the expansion was decelerated. This was the historical reason for the now-obsolete deceleration parameter. Since Gunn & Gott’s analysis related the mass of the cluster to the deceleration parameter, a given gas fraction placed a constraint on the deceleration parameter. (Remember, they did not know about dark matter, so for them, in a cluster the mass in gas plus the mass in stars had to be the total mass). They found a constraint that meant the deceleration parameter was very close to zero: in fact, we now know it is negative (negative deceleration = acceleration, which is what we now observe due to dark energy). They wrote: “The universe must be open (hyperbolic) unless most of its mass is hidden in zero-rest-mass fields on in collapsed low-luminosity objects.” In other words, to have a spatially flat (no curvature) universe, you need more density than was known to exist in 1972 if you have as small a deceleration parameter as Gunn & Gott found was required. (A hyperbolic universe has negative curvature and is open; a spherical universe has positive curvature and is closed). Thus, either the universe was open (hyperbolic), or there were additional, unobserved sources of density. It turns out that it is the latter, and in fact, it was the idea that the Universe was spatially flat combined with the absence of the required density that did in the 1980s and ’90s lead to postulation and discovery of dark matter and dark energy. What Gunn & Gott saw was early evidence that the universe must (if it were flat, which they did not have an answer on in 1972) have additional sources of density.